...it should come as no surprise that if you aren't persuasive, you can forget it. By the way, everyone at all stations of life are trying to persuade someone of something. 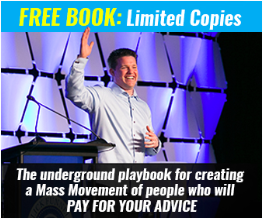 Learn To Persuade By Claiming Your FREE Copy of Expert Secrets TODAY! Having said that, persuasion is a MUST if you're selling something...it's a must because it drives revenue. Language matters and it often appears in it's most scalable format: copy. Written word can be in many places at once when you can't. So, how do you write in a persuasive way? This style must need a level of sophistication and mastery you don't currently have, right? Persuasion isn't about the content of what you are saying so much as it is about the WAY you say it. You need to light up the reader's mind. Animate the important. Contrast against the mundane. Pictures that you can create in the mind of the reader will compel the caveman mind to act. SHOW them the way. Copywriting is a vital tool in every marketing funnel. Yet, here is the primary difference in showing and telling: the use of passive verbs and active verbs. Instead, we need to dumb it down. Distill your language to a point where the reader/listener doesn't have to think to understand it. Passive verbs fuel sentences that need too much thought. Active verbs take control of the mind and guide them to the writer's desired meeting spot. "John's eyes lit up like Time Square when he received the news that his brother Jim had rallied to win the match in overtime." "Nancy was scared by the animal hiding in the trash." "Nancy let out a scream that would quiet a banshee when the racoon appeared. One of the worst things you could do is have an "all-inclusive" style of writing. Your copy shouldn't be a honeymoon resort where you can have as many fruity drinks as you wish. Your copy should qualify and disqualify leads at the same time. ...make sure you program alarms in your mind that will go off when you use dead words and phrases. If your copy doesn't run people off (who aren't interested in your product) something is wrong. Push to have people on your email list or in your database that have the greatest potential of liking your product or service. Everyone else, let them go clog up someone else's list. "Try My Course For Real Estate Professionals Who Want To Sell More Houses and Find More Clients"
"Finally, A System That Makes Real Estate Agents Dominate The Property Investment Niche and Develop An Endless Supply of House Flippers To Sell To." I'll take door number 2...if I'm a hungry real estate agent in the property flipping niche. One tool that I love to use is http://www.hemingwayapp.com/. Start Your Free 14 Day Clickfunnels Trial Today! It's a real time copywriting editor that will tell you what's wrong with your copy as you go. It will help you speak to the inner 4th grader with lazer like precision. Use brain torching copy to qualification leads and customers. Do you enjoy copywriting? If so, why? If not, why? Hit me up in the comments and let's talk about it. Sign up below if you want face melting info that will burn down the barriers standing between you and your goals for sales & marketing.